There are countless, fascinating stories surrounding the earliest Beat Generation writers – likely because they were sort of endlessly fascinating themselves. That, plus they kept writing about their adventures, so legends are born. Any film about the Beats is a dream and a nightmare for writers and cast alike. What writer wouldn’t want to take a shot at a conversation between Allen Ginsburg and William Burroughs? And yet, what writer would dare? The same can be said for any actor hoping to capture these literary characters we know so well from their own pages. But Kill Your Darlings aims to do justice to all of it – the movement, the participants, the socio-political climate, and the true crime story few recall. Kill Your Darlings revisits that burgeoning circle of geniuses to spin a more somber origins story than those we usually hear. Rather than emphasizing the madcap, mind-altering, conformity-be-damned journeys of Ginsburg, Burroughs or Kerouac we’ve grown accustomed to, the film is based on the murder that splintered the group. It’s Columbia University of the mid 1940s. 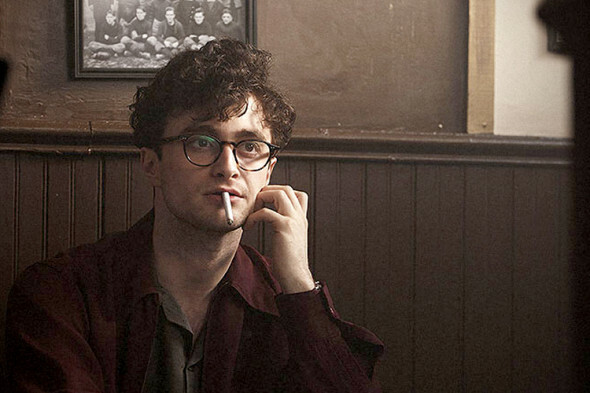 As World War II rages, young New Jerseyan Allen Ginsburg (Daniel Radcliffe) begins his life as a college freshman. He quickly falls in with the wrong sort. Thank God! The film shadows Ginsburg along his journey toward self-expression by way of an infatuation with schoolmate Lucien Carr (Dane DeHaan). Carr introduces him to elder statesman/criminal element William H. Burroughs (Ben Foster), and later, to football playing senior and part time merchant marine Jack Kerouac (Jack Huston – of those Hustons). Together they alter their minds and begin a framework for a new world order for writers. Carr also introduces Ginsburg to David Kammerer (Michael C. Hall), whom Carr would later murder. Though first time feature director John Krokidas has trouble deciding whether his is a coming of age tale or a murder mystery, and though he’s never able to clearly define the events’ connection to the actual writing that would eventually flood from these poets and scoundrels, he pulls together a competently crafted tale buoyed by well defined and tenderly animated characters. Radcliffe’s growth as an actor continues to impress, as does his somewhat fearless choice of projects, but it’s DeHaan who steals the film. Damaged, vulnerable and seductive, he’s exactly the cauldron of conflict that inspires an artistic revolution. Hall, Huston and Foster also impress as Krokidas throws light on some fascinating (if one-sided, fairly fictionalized, perfectly lurid) details of the spark that burst into the Beat Generation. They can’t quite transcend the limitations of a novice director and an under-focused screenplay, but they will compel your attention while they have you.